Edison Pen Co – Introducing a New Retailer Carrying the Production Line – Tim Girdler Pens! Introducing a New Retailer Carrying the Production Line – Tim Girdler Pens! I’m very happy to introduce a new retailer that will be carrying our Production Line. Here at Edison, we are typically a little picky about who carries our Production Pens, and there is no exception in our newest retailer – Tim Girdler of Tim Girdler Pens. (you can see Tim hard at work in the pic below). I’ve known Tim from the Pen Show circuit for a while now, and we’ve done plenty of business in the past. You couldn’t meet a nicer or more honest person! Tim’s business has historically been focused on vintage pen resoration, as well as custom nib grinds and tuning. When he began branching out to selling new pens, we figured that our businesses would compliment each other very well. I encourage you to visit Tim’s site and have a look around. 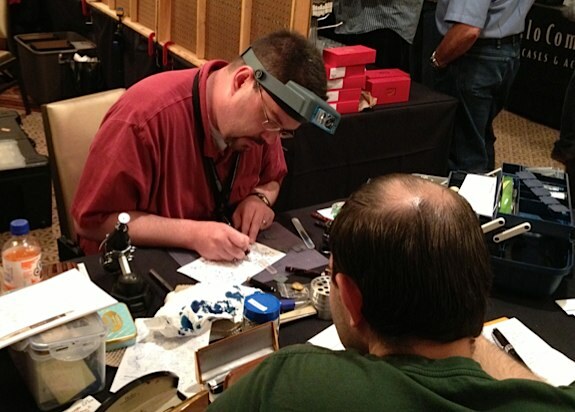 Not only at the Edison Pens, but be sure to check out his custom grind and pen restoration services. Tim spent a lot of time under the tutelage of Richard Binder. You can rest assured of great work when you are in the hands of a protege of Richard’s! You can visit this page to see the Edison Pens on his site. And remember that having Tim as an Edison retailer gives you another option for a custom ground nib on your Edison Pen out the door!